Who says that a sharper knife is a lot more dangerous than a dull one? Well, a sharp knife is definitely safer compared with a dull knife. There is also a fact that if you want to make the best out your knives, there is a need for you to keep them in its tip top condition. But, there are numbers of ways on how you could sharpen your knife. 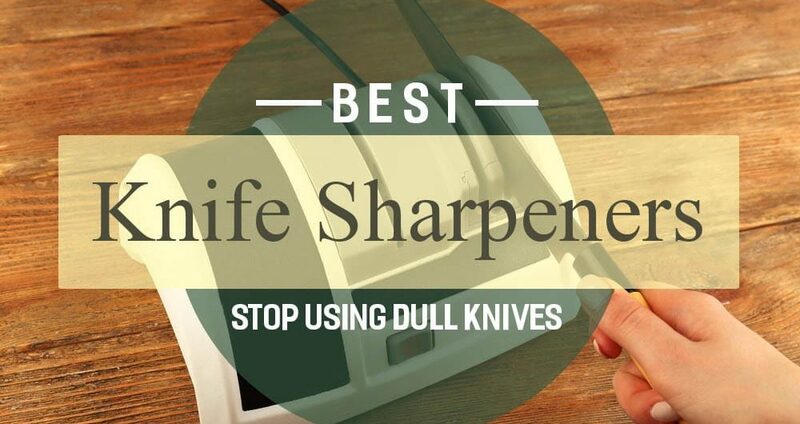 The problem you are to face is to choose whether which one is the best knife sharpener. Take a look at the reviews below to get a better judgment and input before you buy anything. For those that are looking for a sharpener kit that will not harm the tempered blade then this one is simply the best choice. This one is not an electric sharpener and so it doesn’t generate heat and wouldn’t impact the blade temper. It extends the usable life of the knife. And because the blade angle could be set to anything in between 10 to 24 degrees, you can match the existing angle to the knife precisely. In addition, this one could sharpen anything and it has built-in stops that will make sure you don’t cut yourself using it. With a bit of practice, you can sharpen the knife to a keener edge compared to what they had once they shipped from the factory. 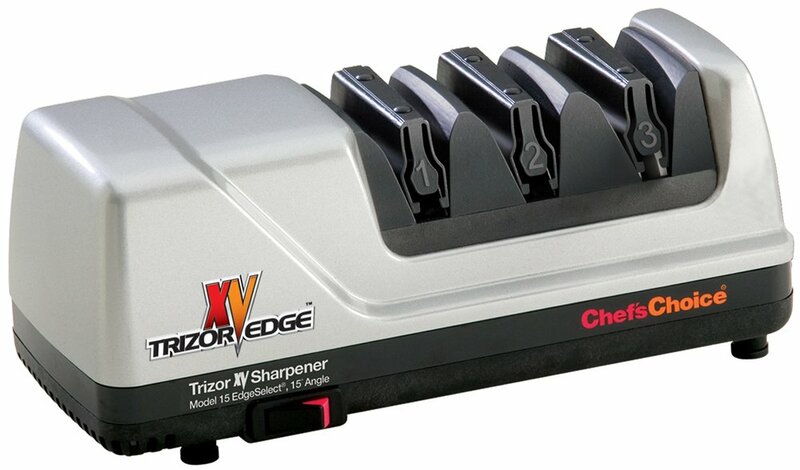 If you are looking for the best sharpener that offers an unmatched sharp edge then this one is a great choice. This one is a very capable product. Why? 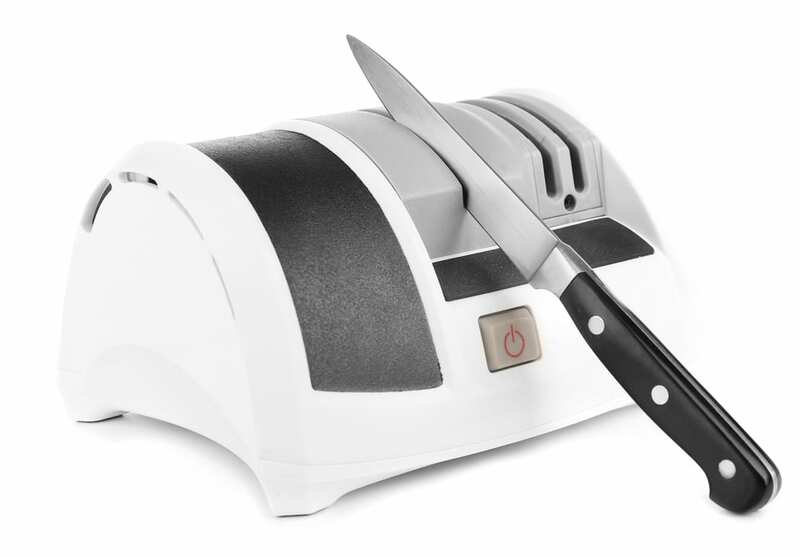 It has 3 stage sharpeners that will work both on Japanese and Western knives. It can create a triple beveled or the so-called Trizor edge. It is a 15-degree edge which is supposed to be very durable because of its shape. In addition, this one is fast and efficient. This sharpener serves to be the best option when it comes to convenient usage. Compared with Apex, this one holds the knife via a clamp system. This clamp can rotate 180 degrees allowing you to easily sharpen both sides of the blades. 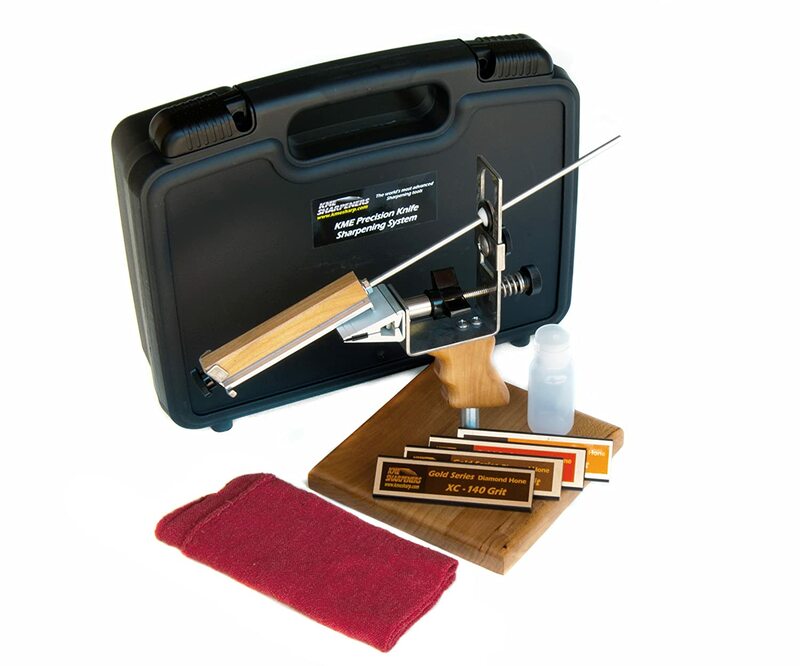 This system includes a set of sharpening stones. The sharpening angle could also be adjusted to between 17 to 30 degrees. This one is a great product that is made of quality components. For those of you who have a variety of knives, this one offers a great flexibility. 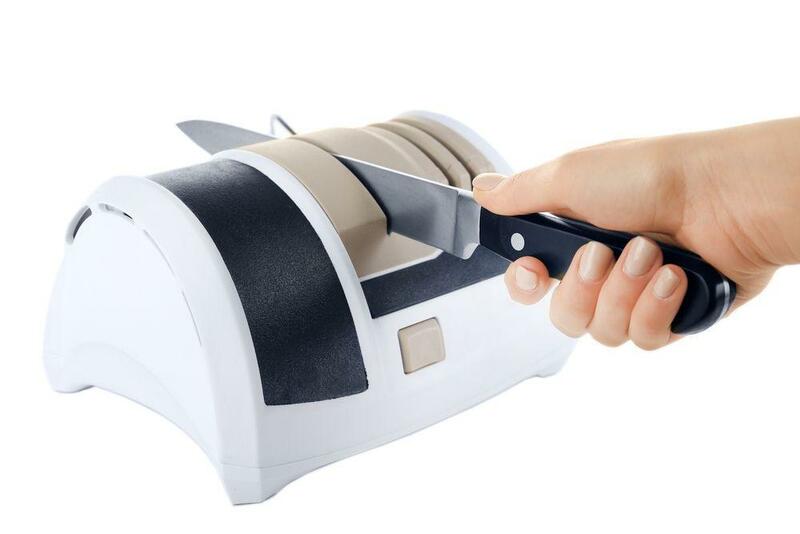 It will save you money, since you won’t need more than one sharpener, this one. This product has the ability to sharpen both the Japanese and Western style knives. It relies on a technology that uses spring guided system which helps in holding the blade at a consistent angle once it passes the sharpening wheels. This is a great unit if you are looking to sharpen a double bevel and single bevel knives. It works efficiently and quickly. For someone that is looking for an electric sharpener which offers great consistency, this one can be a great choice. This sharpener could offer great flexibility, speed and consistency. The angle adjustment would allow you to maintain the original bevel angle. Along with that, the pressure is applied evenly to the blade with the use of a patented grinding wheel system. And the speed of this product is as fast as any unit in today’s market. Cutting acidic fruits as well as vegetables such as tomato and lemon causing corrosion of the blades. There are also some knives that are used in accomplishing tasks which they are not intended to perform such as opening or scraping the tin cans. Blade buckling also causes the damage to the knife because of slicing items which are heavier than the knife and crushing the ice with it. If you also keep the knife in high temperature or if you often wash it with harsh chemical-based detergents might also affect the sharpness of the knife. Also, avoid those heavy wooden cut boards and also immediately wash it with cold water after usage. Everyone who has a knife would need a sharpener. Even if your knife is the highest quality one, it will still lose its edge over time. There will be numbers of problems that could be associated with a dull knife. A dull knife is a dangerous knife. 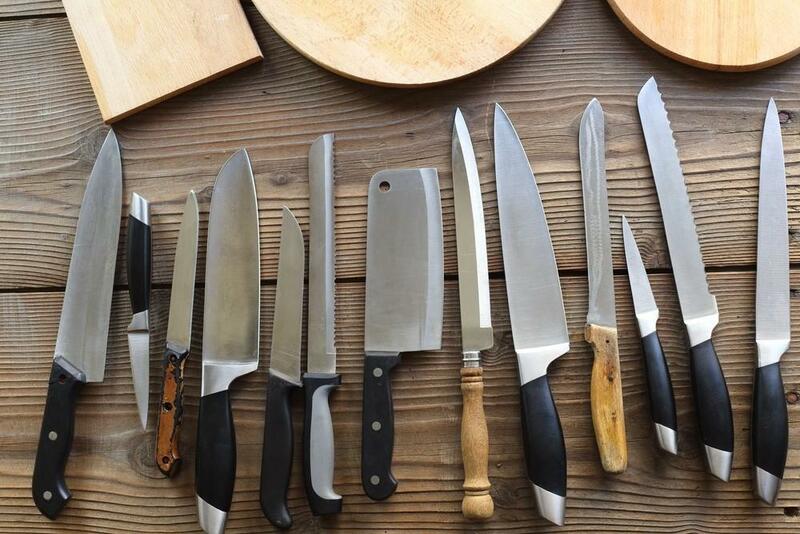 For the knife to work properly, regular sharpening must be considered. 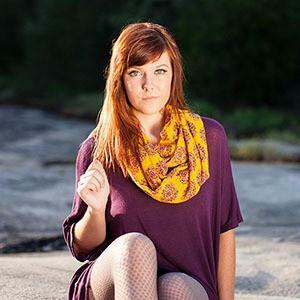 These are less expensive, perfect for those who are on a budget. They would take up almost no space but could be slower than the electric ones. They are considered to be the most popular. These sharpeners are fast, small and could be used so easily. These are considered the old ways of sharpening knives. Stones would need great patience as well as practice in order to properly use them. The professionals would choose the stones. They would offer the best feel as well as flexibility and they also won’t destroy the temper of the steel blade. Though slower compared to electric ones they are less likely to damage the knife. Choose the right type of sharpener for your knife and choose the one that matches your preference as well. The sharpener stone must be harder and heavier than the knife material. material. This stage serves to eliminate the metal from the blade giving it a sharper edge. Scrub the blade across the abrasive stone to remove the metal particles. This one involves the process of drawing the edge to the honing steel. This would help in re-aligning the edges of the blade. This is considered as the final touch on the edge to create a precision sharpness as well as the mirror-like finish on the blade. This is done by polishing the knife on the rotating cloth wheel. In addition, it would help the knife to be sharp a lot longer. You may watch this video for an additional information on how to sharpen a kitchen knife. Some sharpeners are too expensive but more convenient as well. Though personal choice matters a lot, still stick with your budget. Be guided that every sharpener might work at a different pace. 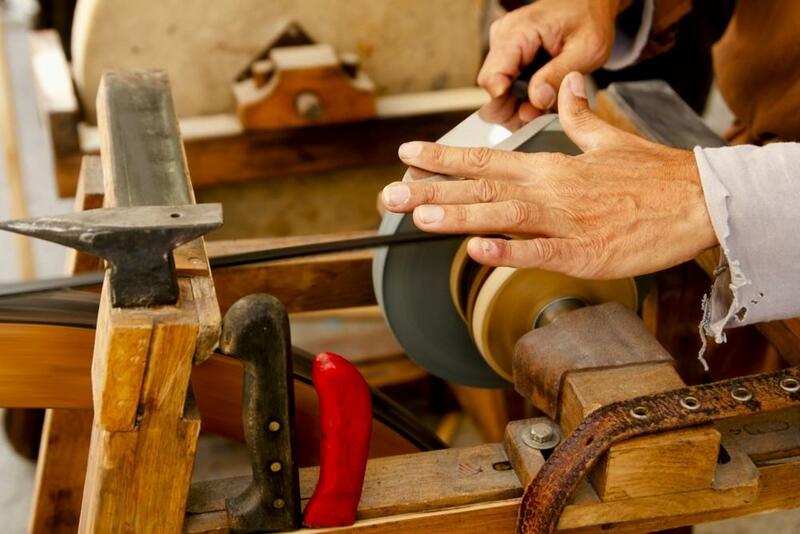 If you want something that is a lot quicker, consider pull-through or electric sharpeners. Consider your knife first. Every sharpener suits a particular knife. There are some sharpeners that are very well-rounded and so could be used with different kinds of knives. Keep in mind that some products might be good for you but others would require a lot of effort. So, an electric or pull-through one could be great if you don’t want to exert too much effort. Choose a product that is very portable, small and lightweight if you plan to take the sharpener with you. 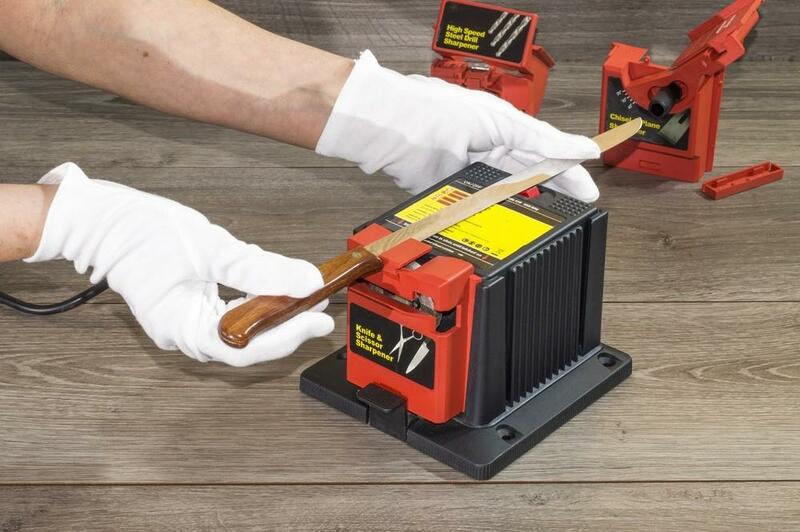 Electric sharpeners or sharpening systems are not a great choice at all but a pull-through or sharpening stone is a great choice. Durability and Warranty. It is important that you make sure that you choose the product that would provide both durability and longevity. And a warranty will make sure that the investment is definitely worth it. This would depend on your preference. If you have bigger space to keep the sharpener then a bigger product is fine. And the same case goes for those with smaller spaces. 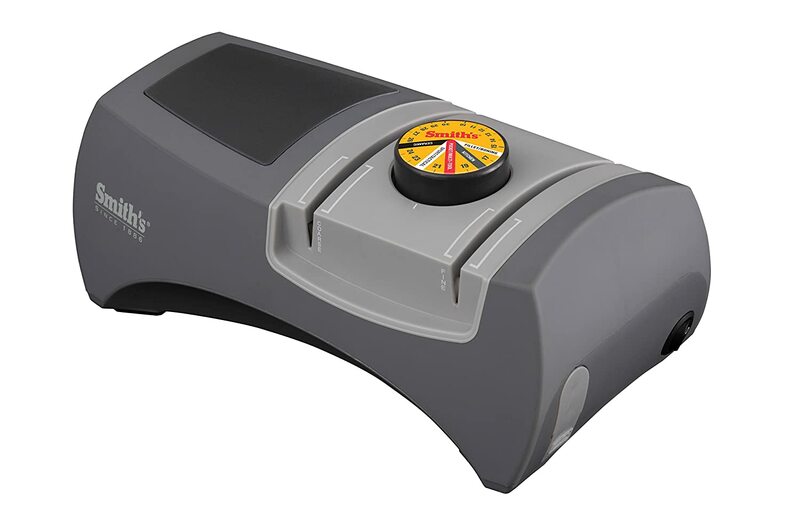 Consider the above-mentioned factors when you plan to purchase the right sharpener perfect for your knife. It is advisable that you first use a great knife sharpener and give it a finish, as this will make the knife stay sharp and good looking. The use of traditional sharpening would need practice and skill. 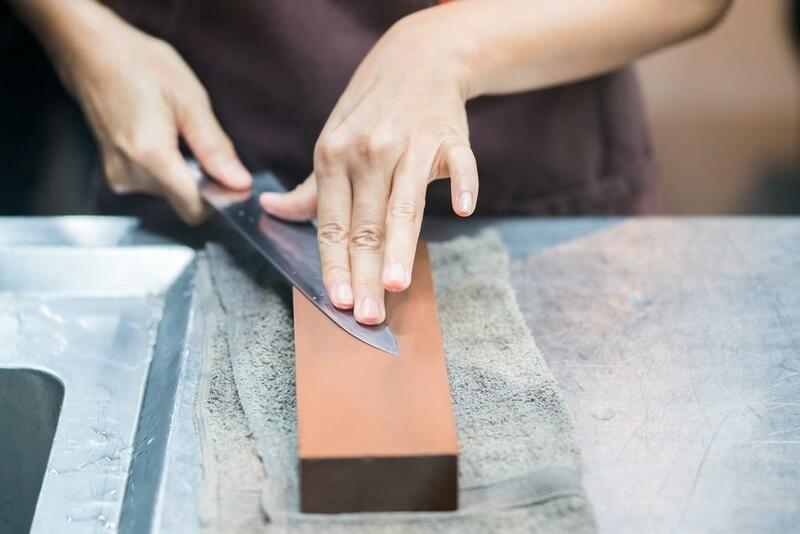 For a knife to be sharp and stays sharp, it’s not enough just to sharpen it, the whole process is required. The straightened edge can be weak and could fold again quickly. And soon enough, this edge would break off or would fold back so tight that it couldn’t be straightened with a steel sharpener and should be re-shaped. A diamond sharpening stone would be for ceramics but you can use a silicon carbide sharpening stone. 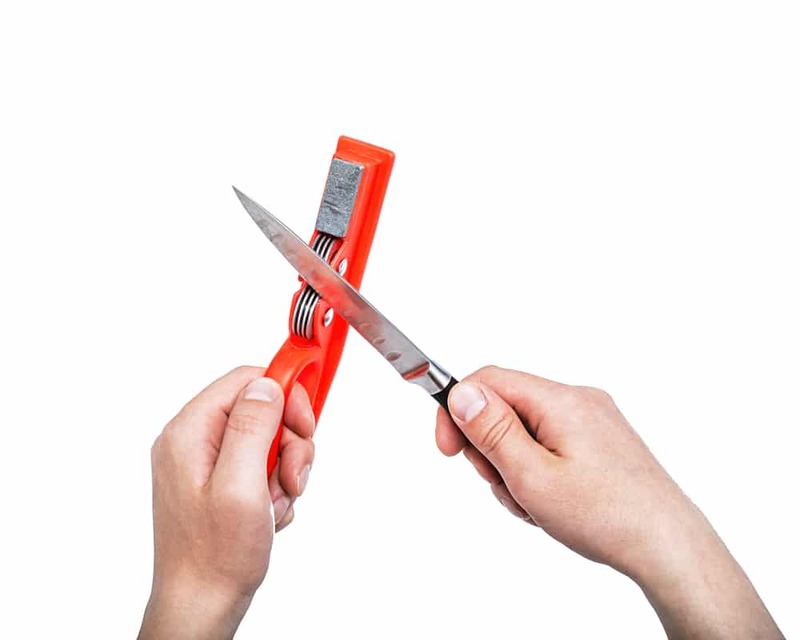 This option is a lot more affordable and is also the next best thing after taking it to a professional sharpener. Why do I need a knife sharpener? A sharp knife is safer to use than a dull one so having a sharpener would make your knife stay sharp and in working order. How often do I need to sharpen my knife? Knives must be honed frequently. Indeed, daily honing is the best. If you hone frequently, you might never need to coarse sharpen the knife. How many times do I need to pull the knife on the sharpener to coarsely sharpen it? It might need 4-6 strokes in general. Inspect its blade after a few strokes and it might sharpen a lot faster. 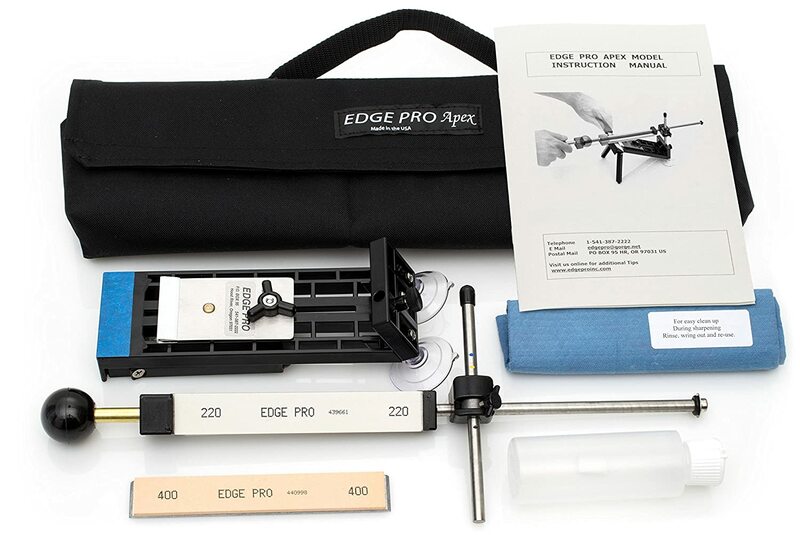 Now, the best one from the options given above is the Edge Pro Apex 1 Knife Sharpener Kit. Why? It has the ability to sharpen blades up to 3 inches wide at any angle in between 10 and 24 degrees offering a great deal of flexibility. It is well-made and also solidly built. It also has the manual operation that is so simple to use for a novice and might not damage the temper of the steel of the knives. It is also very affordable for many people. 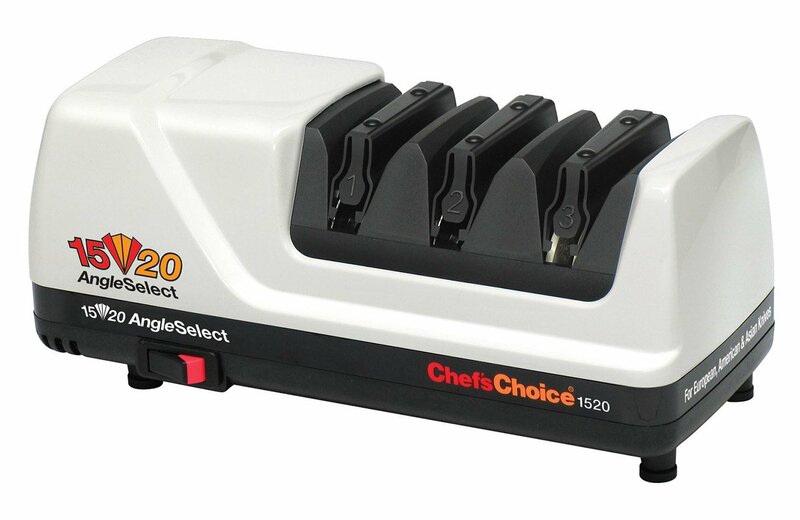 Choosing the best knife sharpener can never be easy but with guidance and the information and reviews mentioned above, things will be a bit easier. On the other hand, if you plan to sharpen a knife without using a sharpener, watch this. Hit like, share and comment now!